Ceanothus is a shrub with abundant, flowers that are similar to those of lilac. They are mainly blue but vary in shade from lightest powder to deepest indigo. There are also pink and white varieties. Most flower in late spring and early summer, though some varieties, such as ‘autumnal blue’ flower in late summer and early autumn. These plants are easy to grow in a sheltered spot in the garden and take little care and maintenance. They add colour to the spring garden and look good with other spring flowering plants and bulbs. Many varieties are evergreen and provide year-round structure to the garden. Another bonus is that the bees love their abundant blooms. 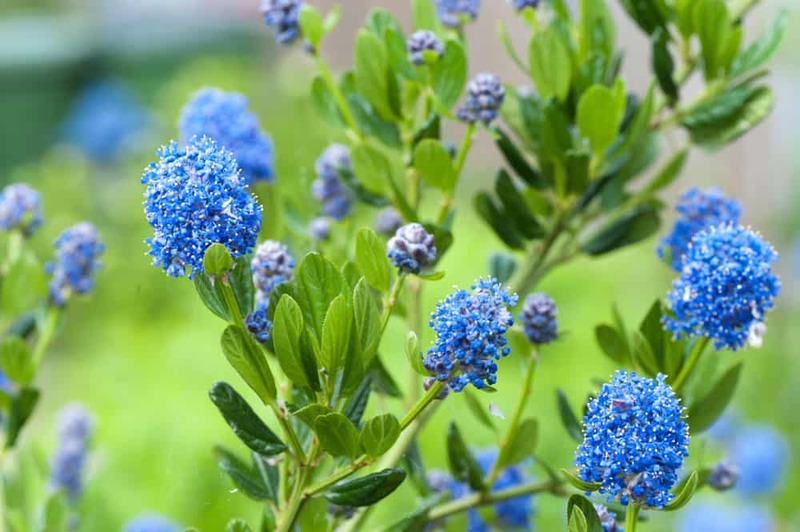 This guide will cover the most popular varieties of ceanothus and how to grow, care for and propagate this beautiful shrub. Some varieties of ceanothus can become quite large, so check the plant details to make sure it suitable for your needs. In addition, flowering times can vary. Most flower in early spring, but there are later flowering varieties if you are looking for late summer or early autumn colour. Varieties are divided into those that are evergreen and those that are deciduous. Deciduous varieties are the most popular and are commonly found in garden centres. The deciduous varieties are less often used; however, they can be useful for colder gardens. Skylark flowers in early summer with compact heads of deep blue blooms. It is a medium-sized shrub with bushy growth and glossy, finely toothed leaves. This variety reaches a mature height of around 1.5-2.5 metres (5-8 feet). Blue mound has brighter blue flowers and is another dense, evergreen variety with attractive oblong foliage. It tops out at 4-6 feet (1.2-1.8 metres) in height. Autumnal blue, as the name suggests, flowers in late summer to autumn. The blooms are a lovely sky-blue. This is a larger shrub, reaching around 3 metres (10 feet) in height. This variety has very attractive foliage that is a glossy dark green, tinged with bronze. The shrub has an arching habit and features small intensely blue flowers in mid to late spring. It is a more compact variety reaching 1-1.5 metres (3-5 feet). An unusual white variety this is an upright shrub with dark green leaves. Its spikes of white flowers appear in abundance in spring. This type can also cope with heavier soils than many other varieties. It can reach 3 metres (10 feet) in height. This is a large variety that can reach 6 metres (20 feet) in height at maturity. It has deep blue flowers in spires of up to 12 cm (5 inches), which are slightly fragranced. This variety is a medium-sized, vigorous shrub with light green leaves and large, powder-blue blooms. It reaches 1.5 metres (5 feet). This is a vigorous variety that has finely toothed oval leaves and dark blue flower spikes that can be 10 cm long. It flowers from July to September and grows to around 1.5 metres (5 feet). This is an unusual rose-pink variety that has large blooms up to 6 cm long. It reaches 1.5 metres (5 feet) in height at maturity. This beautiful shrub will happily grow in most conditions. However, it does not like cold winds and can suffer wind burn if planted in a very exposed area. This will cause the leaves to become discoloured and brown and the shrub will not thrive. Avoid exposed areas and frost pockets to give this plant the best chance of flourishing. If you plant this shrub in a sheltered spot you will be rewarded by many years of trouble free blooms. If your garden is colder, deciduous varieties such as ‘Glorie de Versailles’ can tolerate more exposed sites. Of the deciduous varieties, ‘Autumnal Blue’ is one of the hardier types. Ceanothus likes a sunny, sheltered spot away from harsh winds. It is particularly fond of a south-facing wall. This plant likes free draining soil and may suffer from root damage and poor growth if allowed to sit in waterlogged soil. Water in dry periods for the first year. Once established your plant will not need watering unless the weather is exceptionally dry for a period of weeks. Ceanothus likes fertile and free draining soil. It will tolerate lime; however, poor, shallow chalky soils may not provide enough nutrients and your shrub could suffer from chlorosis in these conditions. This may result in the leaves becoming yellow between the veins. Ceanothus benefit from a good mulch in late winter. Keep the mulch a few inches away from the plants stems to reduce the risk of rotting. In addition, you should feed your shrub with a with balanced slow release fertiliser in early spring or blood fish and bone if the soil is less than ideal. Choose a position in good sun and protected from strong winds. The soil should be free draining and not boggy. Dig a hole twice the width of the rootball and sprinkle in a little blood, fish and bone or other organic fertilizer unless your soil is very fertile. Position your plant in the hole so that its stem is at the same level as it was in the pot. Backfill the hole and firm the soil in around the roots. Water well to settle the soil and give your Ceanothus a good start. This plant will need regular watering until the roots have had a chance to establish. Once established your plant will require little care and maintenance. They are quite self-sufficient little shrubs when planted in conditions that suit them. All varieties should have any frost or disease-damaged growth removed. They are not particularly long-lived plants but in the right spot and with moderate care they should give you ten years or more of beautiful blooms. Most varieties of ceanothus flower in late spring to early summer. They look good underplanted with late spring bulbs or against a backdrop of spring flowering climbers such as Clematis Montana. Many of the varieties are medium-sized making them good specimens for the mixed border. The early flowering evergreen varieties give good spring colour and then provide a nice backdrop for more colourful perennials in summer. Pruning will depend on your chosen variety. Evergreen shrubs do not usually require much pruning. Young plants may have their tips pinched out to encourage bushiness. If any branches become too long you may shorten them by up to half after flowering. These types certainly do not like harsh pruning and it is best not to cut old wood as the stumps might not regrow. As evergreen types do not respond well to hard pruning it is difficult to renovate a shrub that is overgrown and straggly. In this case, you may be better off replacing the plant. Late summer flowering shrubs such as ‘autumnal blue’ can be trimmed back by one third in spring. Late spring and early summer flowering varieties should be cut back after flowering. Each stem can be can be cut back by one third to one half. Do not prune these types in spring or you will lose that year’s flowers. Deciduous varieties such as ‘Gloire de Versailles’ and ‘Perle Rose’ bear flowers on new shoots each year. This means they benefit from routine pruning in spring to encourage more flowering stems. Young plants can be cut back by two thirds to an outward facing bud to develop a good framework. In the second year, cut all the previous seasons growth by two-thirds and shorten the side branches to 10-25 cm. You may also thin out congested growth from the centre of the crown. Once your deciduous ceanothus is established you should prune back stems that have just flowered by half. You may cut back weaker side shoots even more. Deciduous varieties can be renovated with hard pruning if they become overgrown. Deciduous varieties are best propagated from softwood cuttings in late spring to mid-summer. If the weather has been dry, water your shrub well the day before taking cuttings so that the stems are full of water. Taking cuttings early in the day is also best. You should choose healthy new growth and collect non-flowering shoots as these will root most easily. Take cuttings of 10 cm (4 inches) in length, cutting just above a leaf bud. Pinch out the soft tip and remove the leaves from the lower third of the stem. Dip the stem in rooting hormone powder and insert into holes made with a dibber or pencil in 4-inch pots of potting compost. Mist well and cover the pots with a plastic bag held secure with an elastic band. The cutting should be placed in a sheltered position in a frost-free place in bright, but not direct sunlight. Remove the bag each week to water the plants and give them an airing. Remove any dead or dying matter. You should remove the bags completely once you see signs of new growth. Evergreen varieties are best propagated by semi-hardwood cuttings in mid-summer. The stems should be hard enough that they snap when you bend. This will still be the current year’s growth; however, it will have become a little woodier by now. Do not take cuttings from old brittle wood from previous year’s growth. The process is virtually the same as taking softwood cuttings however these will take longer to root. Choose healthy, non-flowering side shoots. Each cutting should be 7-15 cm long, so you can make more than one cutting from a shoot if it is long enough. With a very clean sharp knife make the cut just below a leaf node. Each cutting should have one or two more nodes. Remove the soft tip then remove the leaves from the lower third of the stem. Dip the cuttings in rooting hormone powder. Prepare four-inch pots with potting compost mixed with some perlite for good drainage. Make holes in the compost with a pencil or dibber. Insert the cuttings into the holes and mist well. Cover the pot with a plastic bag secured with an elastic band. You should keep your cutting in a warm, bright place out of direct sun. Check the cuttings weekly and remove the plastic to give them an airing. Remove any dead matter and water before replacing the bag. Remove the bags once you see signs of new growth. Ceanothus are not usually troubled by pests and diseases. However, occasionally they may be affected by scale insect or honey fungus. Scale insect infestation can lead to weak growth and loss of leaves. Scale insects have a protective waxy coating over them when they are mature. This makes them difficult to treat with pesticides. However, the eggs and immature adults or ‘crawlers’ can be treated with pesticides. This will need to be applied repeatedly, from May onwards, to break the life cycle of this pest. Honey fungus is the common name given to various species of fungus that attack the roots of many woody plants. You may see fungal growth between the bark and the wood, usually near the ground. The fungus destroys the roots of the plant and can cause it to die. The symptoms may increase over several years or maybe quite sudden. Often the first sign is plants that struggle in dry weather. This is because the roots are no longer able to collect water. Other signs may include pale leaves and failure to flower. Occasionally the plant may flower abundantly but this is not necessarily a good sign as it can indicate the plant’s desperation to propagate before death. Honey Fungus rarely affects Ceanothus but when it does it is serious and there is no known chemical control. The only effective remedy is to remove and destroy the plant and replace it with something that is resistant to honey fungus. Q I recently planted a Ceanothus skylark, in my heavy clay soil. This last week the leaves are beginning to go yellow. I have been watering it daily. What could be wrong? It sounds like your plant may be sitting in waterlogged soil, as clay does tend to become soggy. I would stop watering it daily and only water once a week unless conditions are very hot and dry. I would also avoid fertilising it for a while as over-fertilization can cause yellowing leaves. Q Many of the branches on my ceanothus are dying off. I’ve heard that these plants live fast and die young. Is mine on its last legs? This could be the case, unfortunately. Ceanothus have a lifespan of 5 to 10 years on average, so if yours is reaching this it could be past its best. The other possibility is that your shrub has been damaged by high winds. These plants really don’t like cold exposed sites. You could try installing a trellis or screen to protect your plant from strong winds. Q I was recently given a Ceanothus ‘Autumnal Blue’. Can I grow it in a container as I don’t have much space in my garden? Ceanothus does not usually do well in containers. You might get away with a very compact variety such as Blue Sapphire, however, the variety you have been given reaches a height of 3 metres (10 feet). If you can find space somewhere it will give you many years of abundant blooms. However, if you really don’t have space, I suggest you find your ceanothus an alternative home and buy something more suited to container growing.